He who does not love does not know God, for God is love. 1 John 4:8 The revelation of Jesus Christ is not at all a liberty to sin; it is freedom from sin. We are mistaken to think otherwise. Yet we carry this message in earthen vessels, in human frailty susceptible to temptation. To be saved we must confess sin, claiming to be absolutely no good, and repent in the face of God Almighty. Faith must work. Christians are set free from death. The tough issue we face from then on is our continuing infidelity. None of us is fully consistent. Thank the Lord that our salvation is not conditional. Our position in Jesus Christ is our condition. When will we get it through our thick heads that since we live by His Spirit we can walk not in our flesh but in God's love? We have an awe-inspiring mission and everywhere people need Jesus. How are we supposed to convince the world of God's abiding truth when we are imperfect? Just give a cup of water in the name of Jesus and He loves through you. 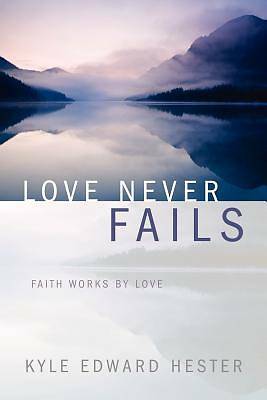 Not by faith alone-faith works by love.